The Hatsune Miku Symphony 2018-2019‘s long-anticipated June 4th update has revealed the concerts’ main visual by Rella, the highly well-known Hatsune Miku illustrator. 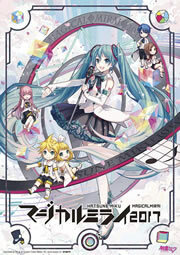 The main visual features Hatsune Miku and friends joined by Kasane Teto in attires inspired by orchestra instruments. In addition to the visual reveal, ticket pre-sale begins starting now until June 11th at 23:59 JST. The pre-sale is available in two options: the Special Seat option at 14,800 yen included with an exclusive ticket, goods, and a brochure, and the non-Special Seat option consisting of S and A seats (9,000 and 8,000 yen, respectively). Ticket pre-sale for U-18 seats (A seats for those under age of 18) will open on June 18th at 12:00 JST~June 25th at 23:59 JST. Additionally, a first-come-first-served accommodation plan with limited goods has been announced for July 2nd at 12:00 JST~July 23rd at 12:00 JST. The general release date is September 8th. The Hatsune Miku Symphony 2018-2019 will be held in Pacifico Yokohama National Convention Hall of Yokohama in Tokyo on November 24th, 2018 and the Orix Theater in Osaka on January 25th, 2019. The performances will be carried out by Tokyo Philharmonic Orchestra and Tokyo Philharmonic Orchestra for Tokyo and Osaka performances, respectively, with Hirofumi Kurita as the conductor.